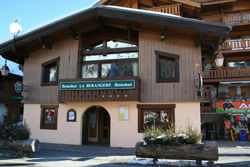 Since 1912, in the center of the village, the friendly people at La Berangere have welcomed visitors from near and far. Come and enjoy authentic cuisine Savoyard, galettes, signature hamburgers, unique cocktails, and excellent wine list. You can make reservation for birthday parties, wedding receptions, or any special occasion. Environment / Access : Situated opposite the Tourist Office.